Delta Force Paintball has built its reputation on offering the ultimate paintball experience for all customers. We are now the world’s largest operator of paintball games and continue to lead the way in terms of safety, professionalism and quality game scenarios. None of this would be possible though without having an amazing group of people both behind the scenes and on the day to make sure you have the very best paintball experience possible. From the construction team, to the marketing and event co-ordinator gurus, to the managers and marshals that you meet on the day of your event; everyone pulls together for you, the customer. Working in the paintball industry must be one of the best jobs in the world, which is why when you visit any Delta Force paintball centre in Australia you will meet our happy, enthusiastic and friendly staff that are there to make your paintball experience as enjoyable as possible. These guys are experts in the world of paintball and some of our staff even play in national and international competitions. They love what they do and that is clear to see. If you have any questions about the sport of paintball, our managers and marshals are the people to ask. They’ll be your referees for the day and will also be able to give you some local knowledge on the best locations to attack each game zone from. They’ll also be the ones to issue you with your equipment for the day. Delta Force has invested heavily into offering you the latest state-of-the-art equipment, making your experience more comfortable and safer than ever before. With our 100% safety record, you can play at Delta Force knowing that you are in safe hands. Not only will the full-length overalls, body armour, ammunition pack and helmet make you look the part, but also you’ll feel the part and will be ready for battle. 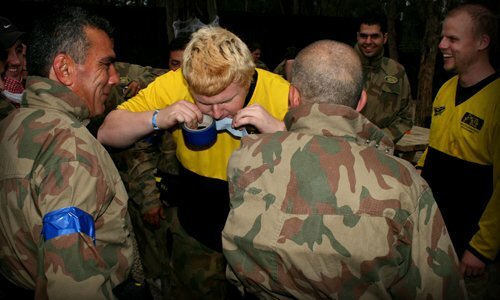 Get the troops ready and contact us today on 1300 850 744 for the adventure of a lifetime.